The aging Baby Boomers are placing downward pressure on economic growth in recent years, and over the coming decade, possibly two. As they continue to enter retirement, net growth rates are and will be slower than we have become accustomed to. Take employment for example. For every retirement, a business must hire two workers to see net job growth. The first worker simply replaces the retiree, resulting in no job growth. A year ago, our office explored these issues a bit more in depth. The upshot is there should be enough jobs in the future, but the topline, net job growth numbers mask the generational churn below the surface. It should also be pointed out that these recent retirees are not just any old workers. They represent workers with a lifetime of experience and institutional knowledge for their industries and firms. Such workers cannot instantaneously be replaced. It creates challenges for businesses to adjust and adapt. However it also creates new opportunities for current and future workers to gain experience and grow into these roles. While these trends are undoubtedly true across the economy, they hit especially close to home here in the small world of Oregon economics. This fall, we say farewell and happy retirement to both Paul Warner and Tom Potiowsky. Paul may be better known for his role as the Legislative Revenue Officer these past 18 years or so, however prior to that Paul was the State Economist throughout the 1990s. Tom was a professor of economics at Portland State University in the 1980s and 1990s before succeeding Paul as the State Economist for the 2000s. In recent years Tom returned to Portland State where he chaired the Economics Department and launched the Northwest Economic Research Center (NERC). Tom has officially retired from the faculty but will continue working at NERC. Paul’s retirement is official as of today. However both promise to be around to offer us guidance and counseling. With the simultaneous retirements of Oregon’s two longest serving State Economists, now is as good of time as ever to examine their careers and forecasting records. Our office after all is tasked with forecasting state tax collections. To this end our office has created a few State Economist statistics. Given Oregon’s unique kicker laws, there is a very tiny window for which our office’s forecasts can hit the sweet spot. That happens when actual tax collections come in right at our forecast or slightly above it and yet below the kicker’s two percent threshold. Over the decades this has occurred just twice, one indication of how hard it is to hit the sweet spot. Paul did hit the sweet spot once, for his very first Close of Session personal income tax forecast ahead of the 1991-93 biennium. It was not for another 20 years that our office produced as accurate of a forecast. Now, when it comes to forecasting, one major factor in accuracy is the pesky business cycle and the turning points of when the economy heads into or out of recession. Paul, luckily, never experienced a recession under his State Economist watch. Besides being a great economist, this lack of a recession greatly aided his median forecast error over time. 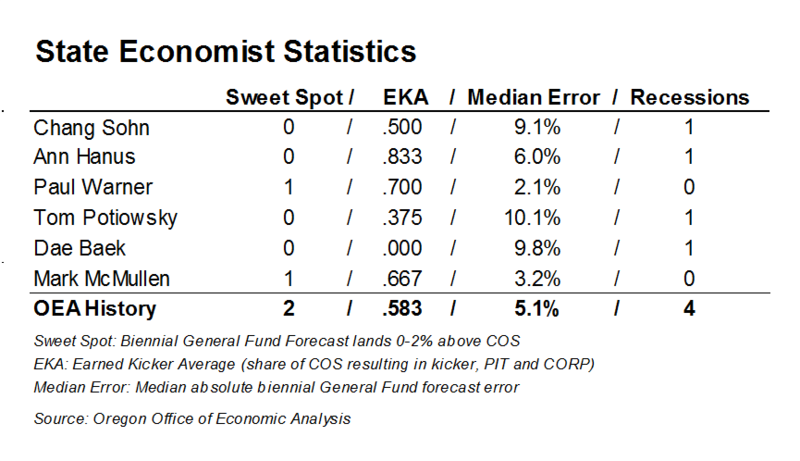 Paul’s forecast errors are the lowest of any State Economist in Oregon’s history. That said, Paul’s Earned Kicker Average, or EKA, was high at .700. What this means is that Paul underestimated revenues by more than 2% (the kicker threshold) on 7 of his 10 Close of Session forecasts (5 each for the personal kicker, and the corporate kicker). Tom on the other hand dealt with a significantly more challenging economy over his tenure and it shows in his State Economist statistics, which take nothing away from the economist and mentor he has proved himself to be. Tom’s first Close of Session forecast was ahead of the 2001-03 biennium, which turned out to be a forecaster’s worst nightmare. Economic growth had slowed, but it was not entirely apparent the economy was in a full blown recession at the time of the May 2001 forecast. The recession is now judged to have begun in March 2001, or right as our office was working on producing that May 2001 forecast. The result of predicting positive, but slower economic and revenue growth when in fact revenues plunged, was a large forecast error. 2001 was also the first time — but unfortunately not the last — that capital gains swung wildly following the dotcom crash. Not to be outdone, the economy soon turned up and on the back of the housing bubble, the 2005-07 biennium yielded the largest personal income tax kicker in Oregon’s history. What Tom’s State Economist statistics show is that forecasting during a volatile economic period results in larger forecast errors. Additionally Tom has a very low EKA – just 3 kickers in 8 opportunities – but when his forecasts did kick, boy did they ever. Every current member of our office and of the Legislative Revenue Office owe a great deal of the opportunities we have had to Paul and/or Tom. We are forever grateful for their willingness to share their time, insights and expertise. Our office and the entire State of Oregon’s analytical functions are better off for their years of service. Their daily presence in the office will be missed personally and professionally. May Paul and Tom enjoy their retirements and come back now and again to help us sort out the mess they made continue in their footsteps.